This is the third theme I have selected from Iain McGilchrist’s book, The Master and His Emissary. The Divided Brain and the Making of the Western World, to look at more closely in relation to education. So far I have explored what he has to say about breadth and depth, and about flow. But I have also in past posts explored other themes with reference to McGilchrist – themes such as truth, betweenness, the meaning of ‘Other’. (I have linked to just one post for each of these latter three themes, but there are others). McGilchrist’s work is an in-depth study of the divided brain. He tells us that both the right and left hemispheres of the brain are involved in almost everything we do, but they are each involved differently. This means that they are both involved in ‘knowing’ but have different perspectives on knowing. New experience engages the right hemisphere; familiar, routine experience engages the left hemisphere. Thus there are two kinds of knowing, which McGilchrist describes as the new and the familiar. 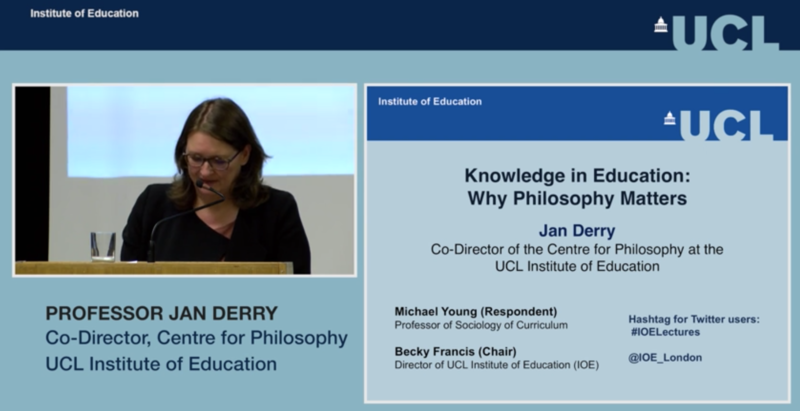 Also this week, I have listened to a recorded lecture by Jan Derry, Professor of Education and Co-Director of the Centre for Philosophy at the UCL Institute of Education. The title of her talk, which was delivered on May 22nd 2018, is Knowledge in Education: Why Philosophy Matters. Jan Derry starts this talk by telling us that there’s intense disagreement in education circles between those who favour facts and disciplines on the one side, and those who favour meaning making and individual expression on the other. This debate has been ongoing for at least 50 years. McGilchrist hasn’t opposed the two kinds of knowing. Rather, as we can see from his book, he makes the case that the favouring of facts and taking a narrow focus approach, is the kind of knowing favoured by the left hemisphere, whereas the favouring of meaning making and taking a wide focus approach, is the kind of knowing favoured by the right hemisphere. The left hemisphere perspective is that knowledge is putting things together from bits, the knowledge of what we call facts. It is fixed and certain. It doesn’t change from person to person, or moment to moment. The right hemisphere perspective is that knowledge is an encounter with something ‘Other’. Interestingly, these two kinds of knowing are not recognised in the English language as they are in other languages. In Latin, French and German there are different words for the first kind of knowledge, where it is pinned down so that it is repeatable, and the second kind of knowledge, which is never to fully know. Jan Derry has suggested that in our current UK education system the focus is on knowledge of facts and memorising these facts for exams and tests. This system promotes a mechanical process of transmission and assimilation, and policy makers deprecate attention given to meaning making. But as Jan Derry points out, simply memorising facts stops well short of understanding them. To illustrate this, she uses a Richard Feynman video (2.05 minutes), who points out the limitations of rote learning of meaningless terms without understanding. Knowledge and perception, and therefore experience, exist only in the relations between things. Perhaps indeed everything that exists does so only in relationships, like mathematics or music: there are aspects of quantum physics that would support such a view. This fact, that knowledge comes from distinctions, implies that we can come to an understanding of the nature of any one thing, whatever it might be, only by comparison with something else we already know, and by observing the similarities and differences. Derry also quotes Robert Brandom (2015) as saying, “one cannot have one concept without having many”, noting that this appears to present a learning paradox. How can you understand one concept unless you understand them all? Our education policy makers’ answer to this problem, and a common response, is to break teaching down into many elements or ‘bits’ and then start from the simple and work up to the more complex, putting the ‘bits’ together, which McGilchrist would recognise as a left hemisphere approach. This is the approach which Jan Derry says comes from a belief that inferences can only be made when initial awareness is restricted to a representation, and only after this representation has been grasped. But she believes, referencing Vygotsky, that meaning making takes an inferential rather than representational orientation to knowledge. Vygotsky suggested that rather than introducing the learner to an accumulation of simple elements, instead we should start by introducing them to a rich domain in which they can begin to make sense of ‘what follows from what’ (relations between ideas), in which their responsiveness to the relevant reasons and relations that constitute concepts, can develop. For McGilchrist we should not only start in the rich domain (the domain of the right hemisphere), but also end in the rich domain. McGilchrist suggests that ‘knowing’ is first experienced in the right hemisphere, before being passed to the left hemisphere for analysis and ‘fixing’, and then should ultimately be returned to the right hemisphere for further appreciation of the whole. For McGilchrist, there are not only two kinds of knowing, but also two different ways of attending to the world, which in turn brings two different worlds into being. McGilchrist makes the case that if we get stuck in the left hemisphere’s world of the familiar, known, and explicit, where we focus on the parts rather than the whole, on abstraction and reification, we run the risk of missing a return to the right hemisphere’s way of knowing, which reflects Marion Milner’s wide focus, Jan Derry’s meaning making and individual experience, and Vygotsky’s rich domain. Difficulties will almost certainly arise when knowledge is approached on the basis of the students’ construction of meaning, but equally these cannot be resolved by teaching facts unless the facts are situated in a network of inferential relation……Access to these inferential relations can be provided in numerous ways; it may involve how a task is designed or by the quality of questioning. Neither meaning making nor the presentation of facts should be dismissed but rather should be brought together through an inferential rather than a representational orientation to knowledge. Likewise, as mentioned above, McGilchrist doesn’t oppose the two kinds of knowing that he writes about, saying we need them both. Currently the left hemisphere’s perspective on ‘knowing’ dominates. A more balanced approach between the two kinds of knowing requires having greater awareness of the right hemisphere’s perspective. In OLDaily this week, Stephen Downes, in a comment on a post by Sasha Thackaberry, makes what to me is an astute point – that the future of education is not the same thing as the future of colleges. This was the trap that the webinar hosted by Bryan Alexander, with invited speaker Cathy Davidson, fell into this week. The event was advertised as ‘reinventing education’, but for me (and I can’t find a recording of the webinar to check my perception and understanding), the discussion was more about how and what changes could be made to the existing education system (in this case the American education system). This thinking is very much influenced by his knowledge of advancing technologies and how these might be used to ‘reinvent education’ but it is not only influenced by technology. For the e-learning 3.0 MOOC these are the questions that we discussed: I regard myself to be adequately proficient with technology, but I don’t have the skills, as things stand at the moment, to keep up with Stephen. However, I am always interested in thinking about and discussing how our current education systems could be improved, and what we might need to do to change them. I am also particularly interested in the underlying concepts, systems and ethics, i.e. the philosophical perspective through which we view education. It seems to me essential that this should underpin any discussion around ‘reinventing education’. Recently I find myself drawn to the thoughts of three well-known thinkers – two current and one from times past; Iain McGilchrist, Sir Ken Robinson, and Étienne de La Boétie (best friend of Michel de Montaigne). Iain McGilchrist (in a nutshell) believes that our view of the world is dominated by the left hemisphere of the brain and that to save our civilisation from potential collapse we need more balance between the left and right hemisphere’s views of the world. I know this sounds melodramatic, but you would need to read his book The Master and His Emissary: The Divided Brain and the Making of the Western World, where he makes a very good case, backed up by loads of evidence, to find support for this claim. Later on this year, on a course offered by Field & Field here in the UK, I will be running a discussion group/workshop where I hope participants will share ideas about the possible implications of Iain’s work for rethinking education. For those who are not familiar with the book, here is a Table* (click on it to enlarge) which briefly summarises some of the differences in the ways in which, according to McGilchrist, the left hemisphere and the right hemisphere view the world. The right hemisphere’s view of the world is presented in purple font; the left hemisphere’s view of the world in blue font. These statements have been culled from many hours of reading McGilchrist’s books and watching video presentations and interviews. 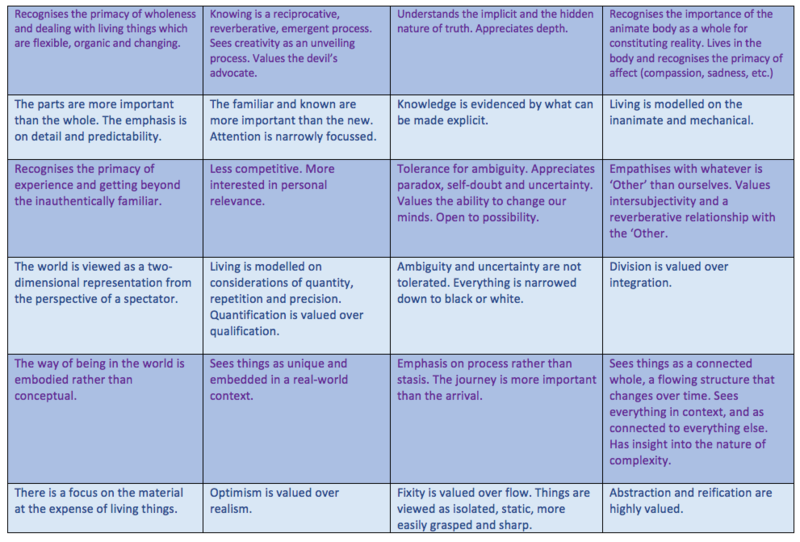 *I am aware that this Table is (necessarily) an over-simplistic, reductive representation of McGilchrist’s ideas. It cannot possibly reflect the depth of thinking presented in The Master and His Emissary. The Divided Brain and the Making of the Western World. It is simply an introduction to some of McGilchrist’s ideas, which might provoke a fresh perspective on whether and how we need to ‘reinvent’ education. In relation to McGilchrist’s work, my current questions are: Do we recognise our current education system in any of this? Do we need to change our thinking about education to achieve more balance between the left and right hemisphere perspectives? Linked to McGilchrist’s ideas (and I will qualify this below, because it would be easy to get the wrong end of the stick), another ‘out of the box thinker, for me, is Sir Ken Robinson. Like many people, I first became aware of Sir Ken Robinson in 2006, when he recorded a TED Talk which has become the most viewed of all time ( 56,007,105 views at this time). The title of this talk was ‘Do schools kill creativity?’ and the thrust of the talk was that in our education system, we educate children out of creativity. More recently in December of last year the question of whether schools kill creativity was revisited when Sir Ken Robinson was interviewed by Chris Anderson under the title ‘Sir Ken Robinson (still) wants an education revolution’. In this podcast the same question is being discussed more than ten years later and it seems that little progress has been made in ‘reinventing education’, at least in terms of creativity. Just as McGilchrist is at pains to stress that both hemispheres of the brain do everything, but they do them differently, for example, they are both involved in creativity but differently, so Sir Ken Robinson says that we should not conflate creativity with the arts. The arts are not only important because of creativity; through the arts we can express deep issues of cultural value, the fabric of our relationship with other people, and connections with the world around us. Creativity is a function of intelligence not specific to a particular field and the arts can make a major contribution to this, but the arts are being pushed down in favour of subjects that are dominated by utility and their usefulness for getting a job. We are now locked into a factory-like efficiency model of education, dominated by testing and normative, competitive assessment. I am recently retired, so a bit out of the loop, but from my perspective not a lot has changed between 2006 and 2019, in the sense that education has not been ‘reinvented’ – notably there hasn’t been, at government and policy-making level, a change in philosophy. McGilchrist believes that our current approach, where left hemisphere thinking dominates, has significant negative implications for education; see The Divided Brain: Implications for Education, a post that I wrote in 2014 after hearing McGilchrist speak for the first time. Robinson believes that although some schools are pushing back against the dominant culture there is a lot more room for innovation in schools than people believe, that we can break institutional habits, and we can make innovations within the system. But can we? What would this take? Would students and teachers be willing to risk ‘bucking the system’ to embrace an alternative, non-utilitarian philosophy of education? Reading this immediately reminded me of the introduction in 2002 of the Key Stage 2 SATs (compulsory national Standard Assessment Tests) here in the UK – the testing of 11- year olds and the start of league tables pitting school against school. Key Stage 1 SATs (tests for 7-year olds) were introduced before Key Stage 2 SATs, so these teachers of 7-year old children had already been through the process. Therefore, by the time the Key Stage 2 SATs were introduced, schools and teachers had a very good idea of their likely impact, and Key Stage 2 teachers complained bitterly. I remember thinking at the time, if all the Key Stage 2 teachers in the country downed tools and refused to deliver the SATs, then there would have been nothing the government could do, but as Sarah Bakewell points out this type of collaborative, non-violent resistance rarely happens. Perhaps reinventing education will have to happen from the ground up, in individual classrooms/courses and institution by institution, rather than nationally. But how will this happen when the teachers and education leaders that we now have in place are themselves a product of an education system which has not: valued creativity as discussed by Sir Ken Robinson; a right hemisphere perspective on the world, as explained by Iain McGilchrist; or a rethinking of concepts, systems and ethics needed to take a new philosophical approach to education as envisaged by Stephen Downes? … we focus on practical issues and expect practical solutions, but I think nothing less than a change of the way we conceive what a human being is, what the planet earth is, and how we relate to that planet, is going to help us. It’s no good putting in place a few actions that might be a fix for the time being. We need to have a completely radically different view of what we’re doing here. Stephen Downes recently posted a link to this report on Innovating Pedagogy on OLDaily, together with this comment. The introduction to this guide (45 page PDF) predisposes me to like it, though as I went through the ten pedagogical models presented (ranging from ‘playful learning’ to ‘learning with robots’ to ‘making thinking visible’) I found myself imagining about how these would be introduced and presented and instantiated (and a whole MOOC curriculum opened up in my mind, yet another project I’d love to undertake but just can’t). ‘ Place-based learning’, for example, speaks to me: I can easily imagine taking some students into a place, whatever it is, and asking them what they can infer from their surroundings. It’s just these sorts of activities that create the perspective and breadth of vision needed to do things like develop the sort of ethical sense I allude to in the next post. Good guide, with useful resources listed at the end of each section. I agree with Stephen’s last two sentences. The report makes for interesting reading and suggests 10 innovations that the authors think have the potential to provoke major shifts in educational practice. Pedagogies which have a long history, have proved to be powerful and engaging, and are now being developed further. Pedagogies that are strongly linked to new technologies. Pedagogies that provide ways of addressing challenges. Pedagogies that respond to changes in society. Playful learning to focus on motivation and process as opposed to memorisation and testing. The report states that: There are concerns that an emphasis on memorising and testing in education leaves no space for active exploration or playful learning. At the same time, playful learning doesn’t fit well in many current education systems. And that is the problem. Playful learning takes time. The whole system would need to be changed to allow for this time, as evidenced by the example included of a low tech, high play school in California. Philosophers such as Aristotle and Plato saw wonder as a spur for learning, when we confront our familiar conceptions and explore strange new idea……The innovative practice here is a curriculum design that builds upon and extends the heritage of wonder, encompassing virtual trips to wondrous places, digital cabinets of curiosities, and student-led object lessons. ‘The fairest thing we can experience is the mysterious. It is the fundamental emotion which stands at the cradle of true art and true science. He who knows it not and can no longer wonder, no longer feel amazement, is as good as dead, a snuffed-out candle’ (Einstein, 1940, p. 5). (Source: McGilchrist, I., 2010, The Master and his Emissary, p.491). The educational philosopher Rudolph Steiner saw children’s early years as a period to stimulate their imagination though wonder at the beauty of nature, the elegance of numbers, the design of artworks, and the telling of a suspenseful story. He saw his Waldorf School as a place to foster a spirit of wonder that combines thinking, feeling, and doing. But wonder is surely not confined to early years schooling. Place-based learning. Location is a trigger for learning. As the report says: Place-based learning isn’t new, but mobile technologies have opened up new possibilities in this area. The report describes how a multi-disciplinary approach can be taken to learning when using location as a trigger for learning, i.e. the location can be used to apply learning from different subjects, for example, from history to mathematics. This reminds me of topic-based learning, which used to be the way children were taught in UK primary schools, pre-National Curriculum. Learning with robots to free teachers’ time so that they can focus on more human tasks. This seems bizarre to me. My personal view is that teachers need less administrative tasks, i.e. we need to do away with the excessive focus on administrative tasks rather than replace them with robots. Drone based learning – enabling and enriching exploration of physical spaces, so that students can visit inaccessible landscapes. The report claims that drone-based learning can extend what can be achieved in fieldwork, which seems fairly obvious. I’m not sure that this can be claimed as innovative pedagogy though – rather it’s good use of an advancing technology. Action learning in teams – finding solutions to apply in daily life through problem solving and raising questions, with a focus on collaboration. Again, this is necessary but not new. Virtual studios. Hubs of activity where learners develop creative processes. The focus is on developing creative processes. Linear ways of thinking are challenged, and uncertainty is embraced through practice. Time previously spent developing traditional skills of sketching and making is now spent on developing literacy with digital tools. Virtual studios are all about online exchange of ideas, rapid feedback from tutors and peers, checks on progress against learning outcomes, and collaboration. They provide tools for recording, reflecting, and archiving. The aim is to support learning through inquiry and dialogue. Virtual studios enable students and tutors to work together even if they are in different places and working at different times. As reported in the document, virtual studios follow similar principles to DS106, a digital storytelling MOOC/course, which started in 2013 , so it’s difficult to think of this as innovative, but maybe it is innovative for schools. Making thinking visible – opening windows into student learning. Digital tools offer a wide range of opportunities for students to construct and express their understanding, alone or in collaboration with others. Again, this doesn’t feel particularly innovative and seems to relate to reflective learning. Roots of empathy – social and emotional learning. Roots of Empathy is an award-winning classroom programme designed to teach children empathy so they can interact with others healthily and constructively. The intentions of the programme are to foster empathy and emotional literacy, reduce bullying, aggression and violence, and promote prosocial behaviour. Decolonising learning – changing perspectives and opening up opportunities. The report says that we need a view of the world that is not white, male and European. We need a curriculum that explores multiple perspectives and promotes the ability to cope with change. Of course, but what will be removed from the current curriculum to allow space for this? Whilst the report provides a valuable perspective on what might be needed in education to counter approaches which focus on learning as ‘something to be consumed, … a set of facts and skills that must be transferred from experts to learners’, I don’t see any of these ideas as being novel or innovative. I do not doubt that they are needed, but if, as the report admits, some of them have been around a long time, I have to wonder what has prevented them from being adopted more widely. It seems to me that if we value these pedagogies, which for the most part I do, then the innovative approach would be to challenge the constraints that prevent them from being adopted, which I would see as an overloaded curriculum and excessive surveillance and measurement of teachers’ and students’/pupils’ performance. As it stands I would expect many teachers to feel that these are just more innovations which they should add to their already over-crowded teaching workload. I can’t see that any major shifts in educational practice will occur unless the underlying constraints and approaches are tackled first. 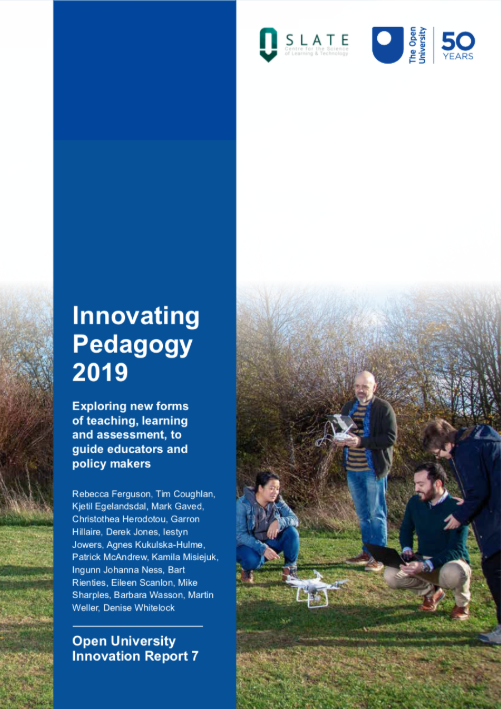 The Open University has published an Innovating Pedagogy Report each year since 2012. It would be interesting to know what the impact of these reports is. How many teachers adopt these pedagogies? Is there any evidence of a shift in understanding of what constitutes quality teaching and learning? This seminar that I attended last week on crafting research was very interesting. It was organised by the Department of Organisation, Work and Technology at Lancaster University, UK, and delivered by Professor Hugh Willmott from City University London. Hugh Willmott has been working with Professor Emma Bell from the Open University. His talk was based on a paper they are working on, in which they are exploring the significance of crafting research in business and management, although having heard this talk the ideas presented seem relevant to social sciences research in general. As editors, we are often surprised by the lack of “pride and perfection” in submitted work, even when there is a kernel of a good idea somewhere in the manuscript. Submitted manuscripts that report results from research designs in which many shortcuts have been taken are rather commonplace. In addition, many papers seem to have been hastily prepared and submitted, with obvious rough edges in terms of grammar and writing style. The seminar started with a look at the online etymology dictionary where we can see that the meaning of the word craft has, over time, shifted in meaning from ‘power, physical strength, might’ to ‘skill, dexterity’. The thrust of the argument made was that researchers should shift towards being craftsmen who are dedicated to the community, have a social conscience and are aware of and acknowledge the ethical and political dimensions of their research. Such an approach would also openly acknowledge uncertainty and bias in research and the role of embodiment and imagination. The image that ran through this presentation was Simon Starling’s art work ‘Shedboatshed’. Starling was the winner of the Turner Prize in 2005. 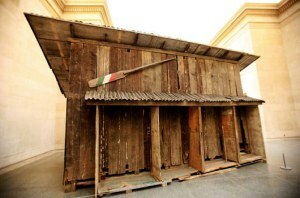 For this work he dismantled a shed and turned it into a boat; loaded with the remains of the shed, the boat was paddled down the Rhine to a museum in Basel, dismantled and re-made into a shed. See: http://www.tate.org.uk/whats-on/tate-britain/exhibition/turner-prize-2005/turner-prize-2005-artists-simon-starling for further information. I’m not sure that I fully understand the significance of using Starling’s work in relation to crafting research unless it’s that his work has been described as research-based and clearly involves research and craft. Maybe it’s simply that Starling deconstructs familiar things to recreate them in different forms? Our goal was to reaffirm the notion that scholarly pursuit in the management sciences is a form of craftsmanship—we are craftsmen! Some may dismiss our arguments as idealistic or romantic. The realities of life as an academic, the pressures we are under—to publish in order not to perish—offer an all-to-convenient excuse to dismiss our ideas. What a sorry state of affairs, but I do know from experience that many journals are not prepared to take a chance on non-conventional styles of presentation; Introduction, Literature Review, Method, Results, Conclusion remains the format most likely to get accepted and to suggest that the research endeavour might have failed or that there is a degree of uncertainty around the results is unlikely to lead to a favourable response. It seems there’s a long way to go before the idea of crafting research in the terms presented by Hugh Willmott is widely accepted. A wide range of Literature was referred to in this seminar, which will be interesting to follow up on. See the references below. Adamson, G. (2013). The Invention of Craft. Bloomsbury Academic. Baer, M. & Shaw, J.D. (2017). Falling in love again with what we do: Academic Craftsmanship in the Management Sciences. Academy of Management Journal. 80(4), 1213-1217. Bell, E., Kothiyal, N. & Willmott, H. (2017). Methodology-as-Technique and the Meaning of Rigour in Globalized Management Research. British Journal of Management, 28(3), 534–550. Cunliffe, A. (2010). Crafting Qualitative Research: Morgan and S Smircich 30 Years On. Organizational Research Methods OnlineFirst. Delamont, S. & Atkinson, P.A. (2001). Doctoring uncertainty: mastering craft knowledge. Social Studies of Science, 31(1), 87-107. Kvale, S. & Brinkmann, S. (2008 2nd edition). Interviews: Learning the Craft of Qualitative Research. SAGE Publication. Wright Mills, C. (2000). Sociological Imagination. Oxford University Press. 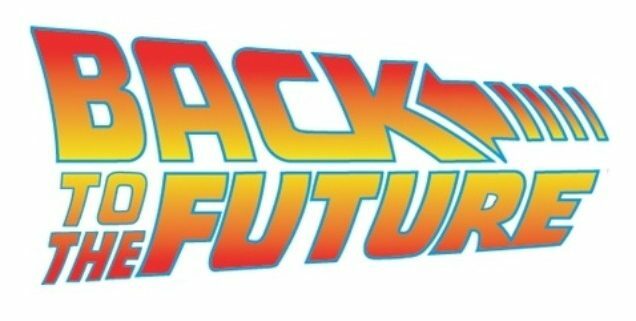 MOOCs: Back to the Future. This was the title of a lunchtime seminar I attended last week in the Educational Research Department of Lancaster University, UK. In this seminar Phil Tubman (PhD student with Educational Research and School of Computing and Communications, and also Senior Learning Technologist in the ISS eLearning team at Lancaster), shared the progress he has been making on his PhD into whether MOOCs are living up to their promises. The title of his talk was chosen to suggest that with respect to MOOCs we currently have our backs to the future. As such we need to turn round and look for ways forward. Given that he works for Lancaster University Phil is well placed to explore social learning in FutureLearn MOOCs. Lancaster University is a FutureLearn Partner. Phil is interested in the problems of sustaining discussion in online forums and the role of the FutureLearn platform in this; FutureLearn claims to be a social learning platform. Phil and his colleagues have looked at discussion threads in forums and found that they don’t include many members and that conversations often do not extend beyond a first reply. These findings are supported by other researchers. Phil and his colleagues have therefore designed an intervention which they hope will increase and improve interaction and social learning in these forums. This is an interactive word cloud which they have called a Comment Discovery Tool (CDT). This tool displays the top 200 words from a forum thread as a word cloud. MOOC participants can then click on a given word to display all the comments which include that word. The example shown in the seminar was from FutureLearn’s MOOC on Wordsworth. Phil clicked on the word ‘daffodils’ in the word cloud which took us to all the relevant forum posts. Having done this, it would then be possible for the MOOC participant to follow the discussion from there without having to wade through potentially hundreds of forum comments and threads. Phil is continuing to develop this tool for his PhD and is interested in whether and how the comment discovery tool will affect interaction in the FutureLearn forums. This is the time of year when many authors/commentators are getting into reflective mode and writing reviews of 2017, not only looking back but also looking forward. One of these is Stephen Downes, who has been prolific in the last few weeks, sharing a number of presentations and his current thinking. Jim Groom in his blog post ‘Containing the Future of OER‘ draws our attention to Stephen’s presentation – Applications, Algorithms and Data: Open Educational Resources and the Next Generation of Virtual Learning. In this presentation Stephen discusses how ‘The next generation of OERs will take a step beyond traditional media and classroom support and begin to take advantage of the unique properties of virtual learning’. Downes, S. (2017). Quantum Leaps we can expect in teaching and learning in the Digital Age. A roadmap. Published by Contact North. page 9. When we teach these students, it’s hard to fight the temptation to teach them for a world that no longer exists. It’s even harder not to teach them for conditions that apply today. The world we are preparing them for, however, is literally a next-generation world. We need to use the technologies of today to teach for the world of tomorrow. page 14. In an education system focused on the future, therefore, the core of learning is found not in what is defined in the curriculum, but in how teachers help students discover new possibilities from familiar things, and then from new things. It is, to my mind, transformation from an idea of education defined as acquisition of skills or progression along a learning path to one characterized by exploration, discovery and finally creativity. page 17. … despite the conservative nature of the educational system, we have conclusively and irreversibly entered the digital society, and students have permanently changed, as has society. The static structures that used to define education have shifted; we are in an era of changing boundaries between formal, non-formal, informal and post-formal education. page 21. We can seek in vain to return to that former understanding, or, moving forward, we can seek to identify those core values that underlie the why of pedagogy. What did it matter what a teacher did? What were the outcomes we hoped for? How does our current understanding of instructional design meet those, or fall short? What can we develop in the future to address these issues? These four quotes resonated with me, as I continue to struggle with what it means to be a teacher and learner in this digital age. Needless to say, I recommend reading the whole document.